The “Robinson” in the title of Kathleen Rooney’s new collection of poems refers to a persona that appears in four poems by Weldon Kees. The “Robinson” poems, as they have come to be known, are widely regarded as being among Kees’s best work. 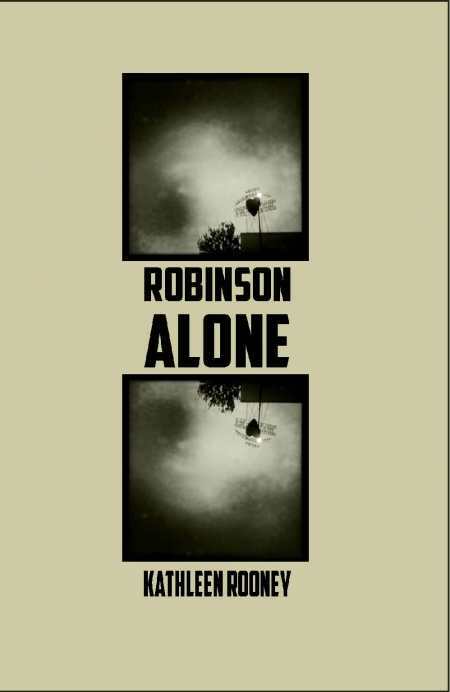 Taking “Robinson” to be Kees’s alter-ego, as prevailing literary criticism suggests, Rooney sculpts a novel in verse that attempts to get between the facts that we know about Kees and explore the mysterious blank space. Kees is, in fact, a figure shrouded in mystery. During his time in the public eye, he was a poet, novelist, jazz musician, and movie reviewer. Kees is no longer with us, but unlike some of his peers (Plath, Crane, Berryman) who committed suicide, Kees’s fate is unsure—his car was found near the foot of the Golden Gate Bridge, but his body was never discovered, and there is reason to believe, based on conversations he had with friends just prior to his disappearance, that he was fascinated with Mexico and desired to relocate to that country. For all anyone knows, he could be alive and well, or at least have lived on past his disappearance. Some of the more interesting poems in this book belong to the series of poems called “Robinson Writes a Letter to Someone,” of which there are fifteen scattered throughout the book. These poems are centos—the text pulled entirely from published letters written by Kees to his friends. Regardless of whether Kees’s text is pulled wholesale from his letters to create the poems, or whether the details of his life and his reactions to his surroundings (often bemused, frightened, or angry) are shaped into poems that illustrate what might have comprised Robinson/Kees’s inner life, Rooney does a masterful job at creating a hybrid novel/memoir of what Kees’s inner life might have resembled. Rooney has created an engaging story that tracks Kees’s professional and interior lives, using the poetic forms that most accurately reflect Robinson/Kees’s state of mind at any given time. Honoring the mystery surrounding Kees’s fate, Rooney gives us an extremely insightful collection of poems that seem to mirror what Kees experienced—the poems are sometimes banal, sometimes haunting, often infused with a dry sense of humor, and almost always full of language that pinpoints a particular form of dread felt by a sensitive man who saw as already present what others thought of as the potential pitfalls of the future. On top of producing an excellent and highly readable book, Rooney does the world of poetry a service by bringing the work of the almost-forgotten Weldon Kees back into the eye of the discerning reader. Rooney’s work excels as a collection of poems as well as a novel in verse. In it, she showcases her superb poetic knack for wordplay to portray the inner thoughts of an enigmatic character.